The procedure of regeneration has shown promising results in the treatment of nonvital teeth with immature apices. However, the tissue being regenerated can only be confirmed through histological examination. This report describes an immature nonvital 12 with apical pathology which was treated via revascularization using 3% NaOCl and 17% ethylenediaminetetraacetic acid as irrigants; Ca(OH)2 as intracanal medicament and platelet-rich fibrin (PRF) as scaffold. On follow-up at 6 and 12 months, healing of periapical lesion, dentinal thickening, and apical closure with a canal exit forming distally were evident. The tooth, however, got fractured and was subsequently extracted at 12 months and sent for histopathological examination. It was revealed that a collagenous matrix for forming hard tissue similar to acellular cementum with a diffuse area of calcification could be seen in pulp space being attached with root canal dentin walls, suggesting that PRF may yield favorable outcomes in regenerative endodontic procedures. The ultimate goal of the endodontic treatment is either to prevent the development of apical periodontitis or, in cases where the disease is already present, to create adequate conditions for periradicular tissue healing. The success rate of nonsurgical endodontic treatment in vital cases is 95% and for necrotic is 85%. However, due to the wide open apex and thin dentinal walls in an immature necrotic tooth, it is not possible to predictably seal the tooth three-dimensionally. For treatment of such teeth, earlier calcium hydroxide and now mineral trioxide aggregate (MTA) or BioDentine apexification is being done so far. However, the remaining thin dentinal walls predispose the tooth to fracture while functioning. Hence, regeneration came into being as the new modality of treatment. Regeneration, also referred to as revascularization, results in apical closure, thickening of lateral dentinal walls along with regeneration of the pulp-dentin complex. It sets the stage for maturogenesis in the nonvital immature tooth. Stem cells scaffolds and growth factors are three important requirements for the success of this procedure. The stem cells involved in the process are mainly stem cells of the apical papilla, periodontal ligament (PDL), pulp, and bone marrow. An empty canal will not support cell growth. Hence, a scaffold is essential to support cell organization and vascularization. Growth factors or nutrients are supplied by the scaffold which helps in stem cell proliferation and differentiation leading to improved and faster tissue development. The important growth factors for regeneration are vascular endothelial growth factor (VEGF) and transforming growth factor-beta 1 (TGF-β1). However whether true regeneration as regarding formation of dentin is occurring or not can only be ascertained via histology of the formed tissue. There are very few cases in the literature documenting the exact nature of the tissue regenerated. Here, we present a case of an immature upper lateral incisor with periapical pathology wherein regenerative endodontic procedure (REP) was undertaken along with another 19 such teeth. Improvement toward success in follow-up visits were observed (which has been sent to JCD for publication, presently under peer review), but the particular tooth had to be extracted after 12 months due to unfavorable fracture that happened on the 6th month. The subsequent histopathological examination was conducted to reveal the nature of the newly formed tissue. The particular patient is a 29-year-old female who reported with the complaint of broken incisal edges of #11, #12. The patient gave a history of fall 20 years back. Medical history and extraoral examination were not significant. No soft-tissue abnormality was found on intraoral examination. The adjacent and contralateral teeth were healthy. The periodontal examination of all teeth showed probing depths within normal limits. There was no response to cold test or electric pulp test on #11, #12. Radiographic examination revealed open apices with periapical radiolucencies (6 mm × 8 mm in #11 and 6 mm × 3 mm in #12) [Figure 1]a. Asymptomatic apical periodontitis with necrotic pulp was the diagnosis. Various treatment options were explained to the patient who consented for REPs with the aid of autologous platelet-rich fibrin (PRF) as scaffold. The methodology followed was based on the guidelines of the American Association of Endodontists and the European Society of Endodontology. After administration of 2% lignocaine with 1:200000 adrenaline and rubber dam application, access opening was done in both #11 and #12. This was followed by working length determination and minimal filing with H-file to remove the biofilm. Gentle, copious irrigation with 20 mL of 3% sodium hypochlorite (Prime Dental, India) over the course of 5 min followed by 20 mL of 17% ethylenediaminetetraacetic acid (Desmear, Anabond, India) again over 5 min was done. 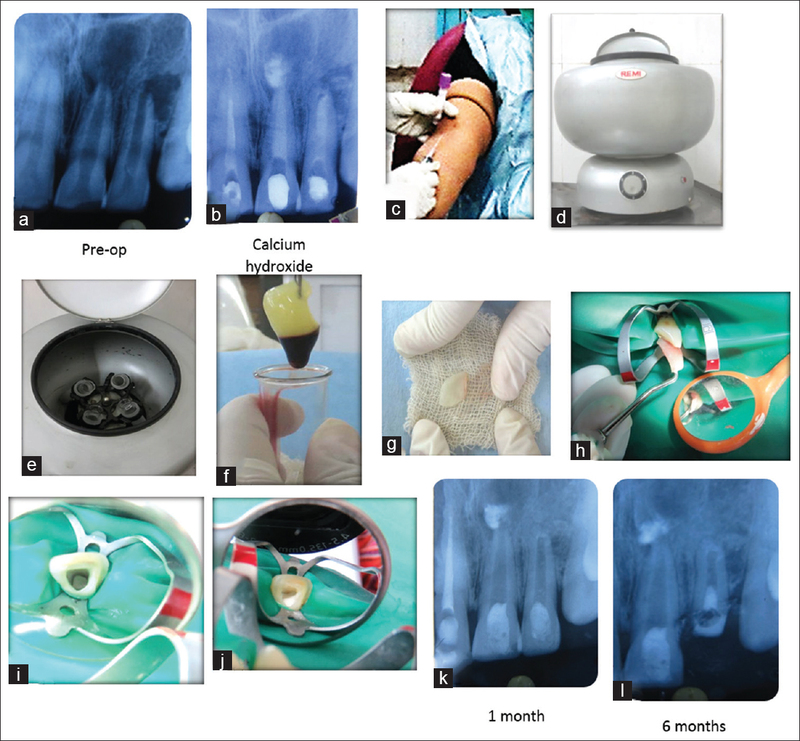 After drying the canal, calcium hydroxide (Ultracal, Ultradent, USA) was placed as an intracanal medicament, sealed with 3–4 mm of Cavit [Figure 1]b (3M ESPE, Germany). Patient dismissed for 1–4 weeks and was asked to report in case of any complaint. On the second appointment, the teeth were re-accessed. Calcium hydroxide was removed via the same irrigation protocol. A volume of 10 mL of patient's blood was drawn from the patient's cubital vein [Figure 1]c, collected in a glass test tube and centrifuged at 3000 rpm for 15 min in a tabletop centrifuge machine (Remi Laboratories, Mumbai) [Figure 1]d and [Figure 1]e.
PRF was obtained in the test tube as the middle layer with acellular plasma at the top and red blood cell (RBC) at the bottom [Figure 1]f. Using sterile tweezers, the fibrin clot was removed and squeezed between 2 gauze pieces [Figure 1]g to drive out the fluids trapped in the fibrin matrix, and autologous fibrin membrane was obtained. The freshly prepared PRF membrane was then placed into the canal opening [Figure 1]h, then pushed below the level of cementoenamel junction (CEJ) [Figure 1]i using finger and hand pluggers such that it reached to the apical end. 3 mm of MTA was placed over the PRF [Figure 1]j followed by placement of moist cotton pellet. The tooth was sealed coronally with cavit. The patient was recalled 24 h later for removal of cotton and replacement of the temporary coronal seal with a permanent restoration of resin composite. The teeth were kept under follow-up. One month follow-up, radiograph revealed periapical bony healing in progress in #11, #12 [Figure 1]k with radioopaque mass deposition at the apex of #12. On 6-month recall, intraoral periapical revealed further progress of healing of pathology and #12 exhibited with more amount of deposition of RO mass at the apical end of root canal (RC) with apical closure and apical curvature of RC with lateral dentinal thickening (LDT) (?) [Figure 1]l, but patient fractured the coronal part of the tooth accidentally. On 12 months recall visit, distinct RO mass and PDL shadow were seen at the apical region of RC with the opening of the canal distally [Figure 2]a, but the radicular part could not be saved and had to be extracted due to previous unfavorable fracture line. The specimen was subjected to histopathological examination. The paraffin wax embedded specimen [Figure 2]b in different sections revealed within apical pulp space an eosinophilic matrix of tissue architecture similar to acellular cementum present externally with a diffuse area of calcification (probably cementum) seen attached with RC dentin walls. However, it could not be seen close to apex possibly due to the fault of processing the histopathological slide or might have been torn out during extraction [Figure 2]c,[Figure 2]d,[Figure 2]e,[Figure 2]f,[Figure 2]g,[Figure 2]h,[Figure 2]i,[Figure 2]j,[Figure 2]k.
REPs were introduced by Ostby in 1961 and popularized by Iwaya et al. and Banchs and Trope. The mesenchymal tissues (e.g., bone, dental pulp, and PDL) appear to have an enriched population of adult stem cells such as inflammatory periapical progenitor cells, dental pulp stem cells, PDL stem cells, and bone marrow stem cells. These cells are called “mesenchymal stem cells” (MSCs) which are found in the orofacial region. Many scaffolds have been used until date like blood clot, platelet-rich plasma and PRF, collagen scaffolds, polyglycolic acid, and polylactic glycolic acid, out of which PRF has shown to be the most promising on account of its biocompatibility and growth factor release. Ease of operation, minimum armamentarium, and no extra cost prompted the use of blood clot., However, it is difficult to induce bleeding up to the level of CEJ at the time and placement of MTA over the blood clot as the coronal seal is difficult. Furthermore, the growth factor release is also unpredictable. Synthetic scaffolds have the potential for toxicity reactions plus increased cost associated. The advent of autologous platelet concentrates came from collecting the most active components of the blood sample (e.g., platelets, fibrin, and sometimes leukocytes) thereby producing a very high-concentration gradient of platelets whose granules are rich with many substances fundamental to promote the healing process including a number of mitogenic growth factors such as platelet-derived growth factors, TGF-β, epidermal growth factors, and VEGFs, which are important for angiogenesis and improve tissue vascularization. This led to the use of platelet-rich plasma, but it was shown that use of bovine thrombin in PRP could lead to the development of antibodies to factor V, XI, and thrombin resulting in life-threatening coagulopathies. PRP releases 81% of total TGF-β1 and similar levels of total platelet-derived growth factor-AB within the 1st day with significantly decreased release at 3, 7, and 14 days. The maximum release occurs before the actual cell ingrowth. Thus, the effect of PRP on bone and dentine regeneration is limited. PRF, a second-generation platelet concentrate which was used as scaffold in this study, leads to the more sustained release of growth factors as compared to PRP due to its different mode of polymerization. PRF has the characteristic of polymerizing naturally and slowly during centrifugation. Since there is no bovine thrombin administration, the thrombin is derived from the blood itself making it physiologic and not prone to adverse reactions. PRF releases its growth factors from its fibrin mesh in a sustained manner with the peak reaching at 14 days which is actually the time of cell growth. The growth factors important for regeneration are trapped in PRF, namely, the most important being VEGF and TGF-β1 which are known to promote the proliferation of MSCs, directing them toward an odontoblast-like phenotype. To maximize their release, it should be used within the first hour. Therefore, soon after preparation of PRF, it was introduced within the RC. For REP to be successful, it is imperative to obtain a bacteria-free canal which can be done only through chemical debridement. Earlier studies used 5.25% sodium hypochlorite, but it was detrimental to the stem cells. It was shown that with increasing concentrations of NaOCl, there was decreased survival of stem cells. A concentration of 3% was used in the present study to achieve balance between maximum disinfection along with stem cell survival. The triple antibiotic paste which was very commonly used as an intracanal medicament was proven to have a harmful effect to the stem cells in the clinically applied concentration, i.e., a paste-like consistency at a concentration of 1000 mg/mL. The ideal concentration was determined to be 0.01–0.001 mg/mL which is not possible to attain clinically. It was discovered that calcium hydroxide (Ultracal) was conducive to proliferation, survival, and differentiation of stem cells at all concentration and hence was used in this study. The tooth #12 exhibited apical closure, with the apical curvature of RC and LDT as early as 6 months [Figure 1]l. Subsequently, histopathology of the specimen, suggest matrix for forming hard tissue seen attached with RC dentin wall [Figure 2]c. There is a dearth of literature in which accurate determination of the regenerated tissue has been revealed which is not possible probably due to ethical reasons. However, there are animal studies that have been published reveal the formation of cementum or pulp-like fibrous tissue ingrowth inside the canal in such situations. The 12 months follow up radiograph shows distinct radiopaque mass and PDL at the apical region with canal opening distally [Figure 2]a. ×2 magnification of apical 4 mm [Figure 2]c shows hematoxyphilic more calcified dentin, the appearance of the structure of which, may be due to fault in the process of decalcification or sectioning. Eosinophilic less calcified acellular cementum with incremental lines over the external surface of dentin also extending its inner wall is also evident. Within apical pulp space, eosinophilic matrix of tissue architecture similar to the acellular cementum presents externally with the presence of a diffuse area of calcification (probably cementum), creating a bridge can be delineated. Patchy calcification within the said matrix is also appreciable [Figure 2]e.
In the coronal part of specimen [Figure 2]f, same hematoxyphilic matrix [Figure 2]c is seen to cover content in the lumen (probably PRF) in touch with MTA placed in the canal, not included in the slide. ×40 magnification reveals fibro-collagenous tissue with extravasated RBC and moderate infiltration of chronic inflammatory cells with collagen in middle, Inflammatory cells at the bottom and eosinophilic collagen matrix at the top [Figure 2]j, Ref. [Figure 2]i (box)). Walling of inflammatory cells by fibro-collagenous tissue and matrix is also present [Figure 2]k and i (arrow)]. The ultimate aim of regenerating pulp-dentin complex may have been a far-off possibility before. However with the advent of PRF and the extensive research on stem cells and the factors affecting them, it is not so far into the future. The authors deeply acknowledge Prof. (Dr.) Kabita Chatterjee, MDS Oral Pathologist of Oral and Maxillofacial Pathology Clinic, Kolkata-37, for her help and co-operation in histopathologic evaluation of the specimen. Hargreaves K, Berman L. Cohen's Pathways of the Pulp. 11th ed. Missouri, Elsevier Inc: 2016. Kerezoudis NP, Valavanis D, Prountzos F. A method of adapting gutta-percha master cones for obturation of open apex cases using heat. Int Endod J 1999;32:53-60. Hargreaves KM, Giesler T, Henry M, Wang Y. Regeneration potential of the young permanent tooth: What does the future hold? J Endod 2008;34:S51-6. Mishra N, Narang I, Mittal N. Platelet-rich fibrin-mediated revitalization of immature necrotic tooth. Contemp Clin Dent 2013;4:412-5. Ostby BN. The role of the blood clot in endodontic therapy. An experimental histologic study. Acta Odontol Scand 1961;19:324-53. Iwaya SI, Ikawa M, Kubota M. Revascularization of an immature permanent tooth with apical periodontitis and sinus tract. Dent Traumatol 2001;17:185-7. Banchs F, Trope M. Revascularization of immature permanent teeth with apical periodontitis: New treatment protocol? J Endod 2004;30:196-200. Diogenes A, Henry MA, Teixeira FB, Hargreaves K. An update on clinical regenerative endodontics. Endodontic Topics 2013;28:2-23. Narang I, Mittal N, Mishra N. A comparative evaluation of the blood clot, platelet-rich plasma, and platelet-rich fibrin in regeneration of necrotic immature permanent teeth: A clinical study. Contemp Clin Dent 2015;6:63-8. Nosrat A, Homayounfar N, Oloomi K. Drawbacks and unfavorable outcomes of regenerative endodontic treatments of necrotic immature teeth: A literature review and report of a case. J Endod 2012;38:1428-34. Jadhav GR, Shah N, Logani A. Comparative outcome of revascularization in bilateral, non-vital, immature maxillary anterior teeth supplemented with or without platelet rich plasma: A case series. J Conserv Dent 2013;16:568-72. Diogenes AR, Ruparel NB, Teixeira FB, Hargreaves KM. Translational science in disinfection for regenerative endodontics. J Endod 2014;40:S52-7. Su CY, Kuo YP, Tseng YH, Su CH, Burnouf T. In vitro release of growth factors from platelet-rich fibrin (PRF): A proposal to optimize the clinical applications of PRF. Oral Surg Oral Med Oral Pathol Oral Radiol Endod 2009;108:56-61. Ruparel NB, Teixeira FB, Ferraz CC, Diogenes A. Direct effect of intracanal medicaments on survival of stem cells of the apical papilla. J Endod 2012;38:1372-5. Wang X, Thibodeau B, Trope M, Lin LM, Huang GT. 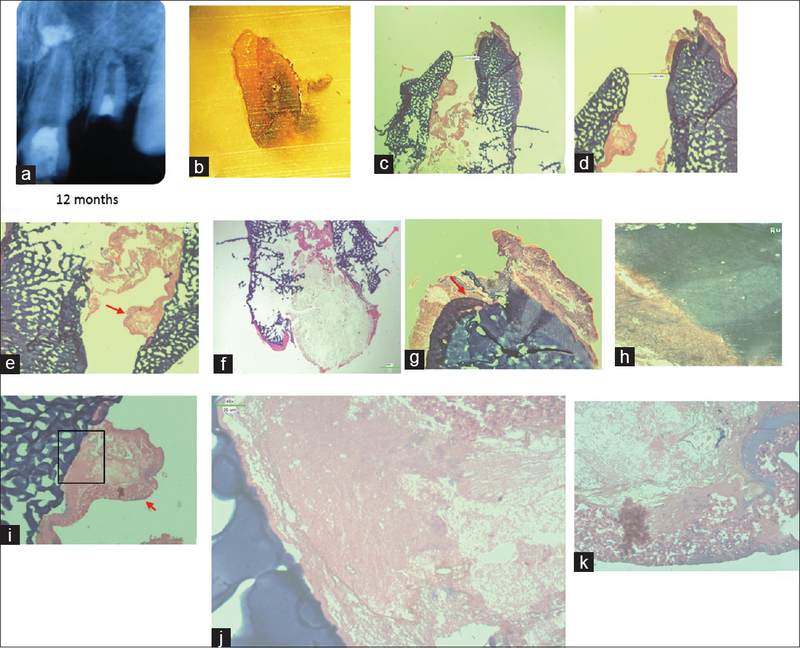 Histologic characterization of regenerated tissues in canal space after the revitalization/revascularization procedure of immature dog teeth with apical periodontitis. J Endod 2010;36:56-63.